You may be mesmerized by the beauty of my babies...I have been a life long doxie lover. I have had doxies since I was 3 yrs old. They are the most sweetest, funniest, stubborn, but loyal little dog. For me there is no other breed that can hold a candle to them. When our pups leave they will have first shot, wormed 3 times with Strongid- T, 5 days of Panacur and 5 days of Albon, a 2 Year Health Guarantee and Spoiled Rotten! 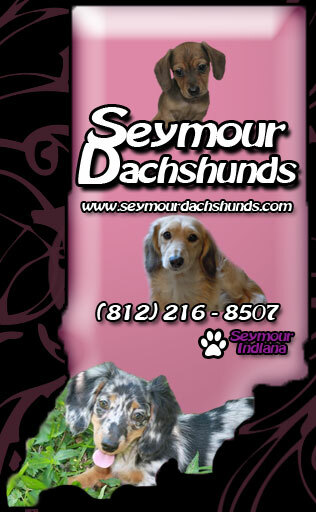 Copyright 2010 - 2012 Seymour Dachshunds. All rights reserved.